Our commitment to labor runs as deep as our commitment to delivering high-quality, affordable care. And with our unmatched model of integrated care, you can count on us to be a strong partner. 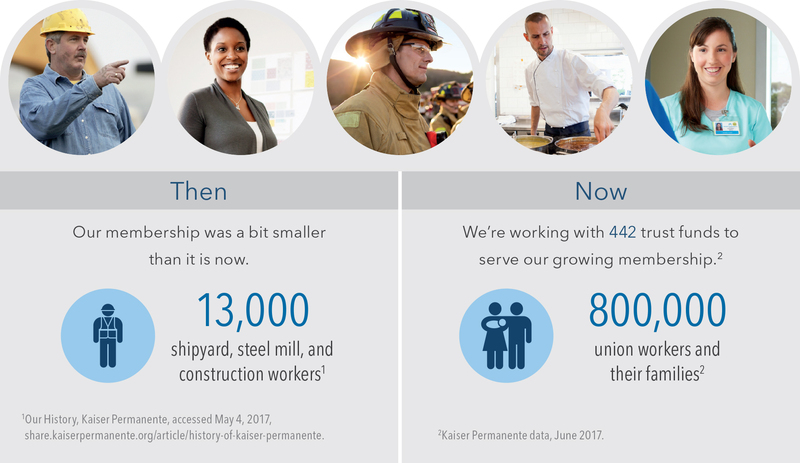 Every day, Kaiser Permanente collaborates with our union workers to help improve what we do. It’s how we got our start — and how we’ll continue to keep your members healthy, strong, and on the job. Since 1945, our membership has come a long way. Today, we’re the largest unionized, nonprofit health care organization in the country. Most of our union workers, managers, and doctors work together to form the Labor Management Partnership, a joint commitment to share decision-making and problem-solving in the workplace. Celebrating it’s 20th anniversary in 2017, this innovative partnership gives employees a real voice in improving and delivering care. The Labor Management Partnership is embodied through unit-based teams — work groups that collaborate to help improve performance. The idea behind unit-based teams is that every person on the job has a valuable perspective. 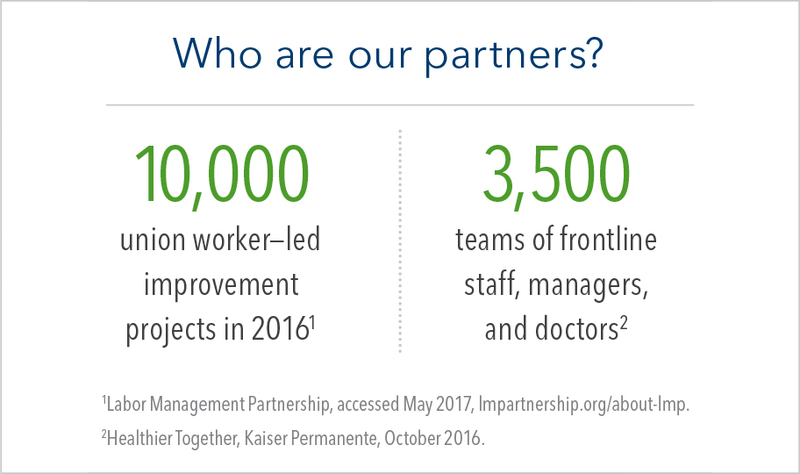 Union members are empowered to contribute to Kaiser Permanente’s national leadership and innovate the way we deliver care. By encouraging employees to speak up, we’re providing better quality of care for our patients and creating a top workplace for employees. Union members are vital to the building and maintaining of our care facilities across the nation. By working together, we’re developing the next generation of hospitals and medical offices — helping to ensure union jobs and strengthening trust funds. Partner with us to help ensure the future health of your members and their families.